Besides her long run as Della Street in Perry Mason, Barbara Hale—who died at age 94 on January 26—also appeared with her husband, Bill Williams, in The Clay Pigeon (1949). Former sailor Williams is accused of treason and murder, but because he has blackouts, he does not know if these charges are true. Hale plays the widow of a war friend who helps him. The screenwriter is Carl Foreman (High Noon, The Guns of Navarone, etc.). Exhibition, Poe in Baltimore and elsewhere. 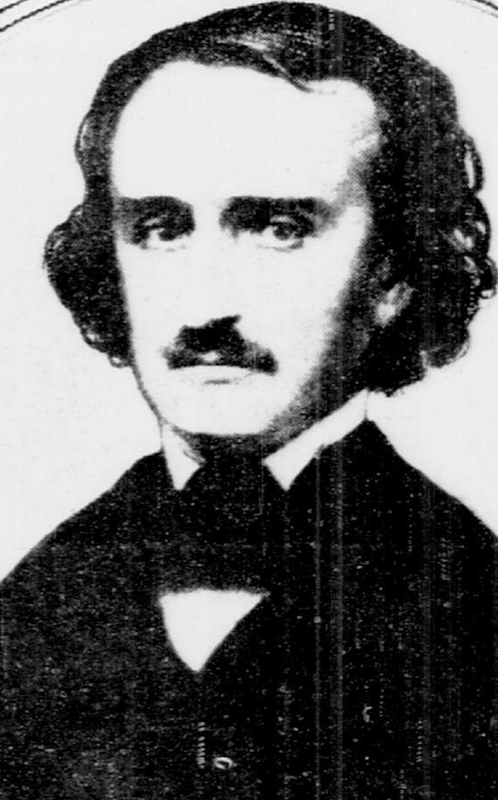 The exhibition "The Enigmatic Edgar A. Poe in Baltimore & Beyond" closes at Johns Hopkins University's George Peabody Library on February 5, but you can check out this online version that discusses his cities of residence and the genres in which he wrote, including "Mysteries & Puzzles" that has images of some of his works. Emil and the Detectives (1931, 1935). 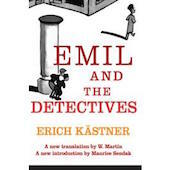 Erich Kaestner's classic 1929 children's novel about a boy pursuing the man who robbed him and enlisting the aid of a band of child detectives had two early film adaptations: a 1931 version scripted by Billy Wilder and a 1935 version. New Web site for Conan Doyle estate. The Arthur Conan Doyle estate has debuted a new Web site with various texts, correspondence, photos, memorabilia, and films about the creator of Sherlock Holmes and his many roles, including author, physician, advocate, and spiritualist. An interesting account is his less than enthusiastic attitude toward the knighthood offered to him in 1902. She Played with Fire (aka Fortune Is a Woman, 1957). Reuniting with a former girlfriend (Arlene Dahl) means arson, blackmail, and murder for insurance investigator Jack Hawkins in She Played with Fire, another product of the team of Frank Launder and Sidney Gilliat, who adapted the novel by Winston Graham (Marnie, Poldark). Gilliat also directs. 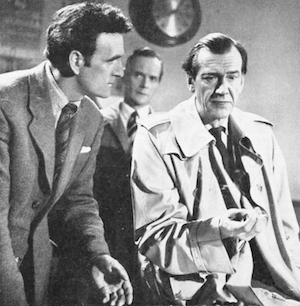 Costars include Ian Hunter, Bernard Miles, and Christopher Lee. Hammett, Chandler, and the Writers Guild. 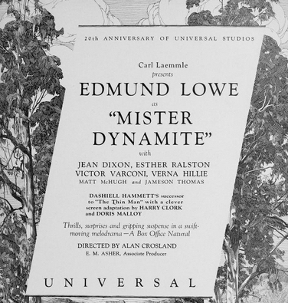 Dashiell Hammett's 1935 membership application (his screen credit of the past three years is listed as Mister Dynamite , which is an adaptation of his "On the Make"). The page after Hammett's application is Lillian Hellman's application. Cover of the guild's July 1947 The Screen Writer, which lists Raymond Chandler's "Critical Notes" that critique the contents of the May 1947 issue. One of his observations (in response to an article by Joseph L. Mankiewitz) is "I do not think a writer has to become a producer or director to be an independent artist . . . there is a cleavage between the creative art of writing and the arts of directing and producing..." (31). The July 1947 issue also has "Writing and Realization" by Meyer Levin (author of the Leopold and Loeb-inspired Compulsion) about a film in Palestine that involved him. The foundation also has posted "The Top 20 Best Written TV Series." No. 15 is Hill Street Blues, no. 9 is The Wire, no. 3 is The Twilight Zone, and no. 1 is The Sopranos. I See a Dark Stranger (aka The Adventuress, 1946). Irishwoman Deborah Kerr and British soldier Trevor Howard become embroiled in World War II espionage involving a little black book and D-Day in this screenwriting effort by Frank Launder and Sidney Gilliat (The Lady Vanishes, Night Train to Munich, The Green Man, etc. ); Launder also directs. 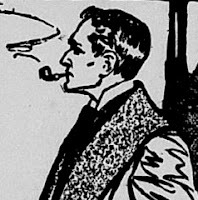 The British Newspaper Archive blog looks at Sherlock Holmes in newspapers, including a peek into the re-creation of 221B Baker Street in London's Sherlock Holmes pub. 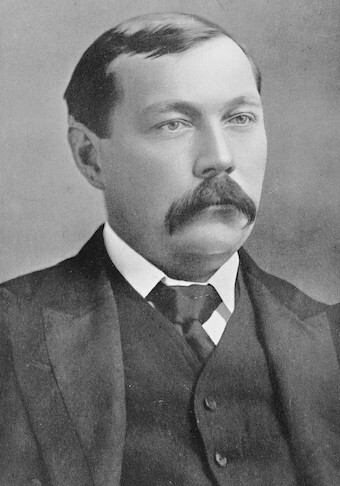 In one clipping, Arthur Conan Doyle discusses the fallout of "The Final Problem": "I was amazed at the concern expressed by the public. . . . 'You brute,' was the beginning of a letter of remonstrance which one lady sent me." A philandering editor finds himself in trouble when he is accused of murdering a friend at the time he was meeting with his mistress. 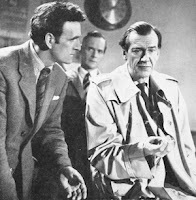 Patrick Holt, Honor Blackman, and Valentine Dyall co-star. 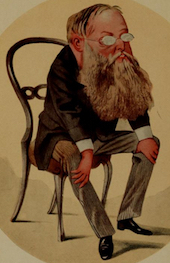 BBC Radio 4: The life of Wilkie Collins. This week on BBC Radio 4 is Peter Ackroyd's examination of the life of Wilkie Collins, including his relationship with his artist father, his friendship with Charles Dickens, his unusual personal life, and his landmark mystery works The Woman in White and The Moonstone. 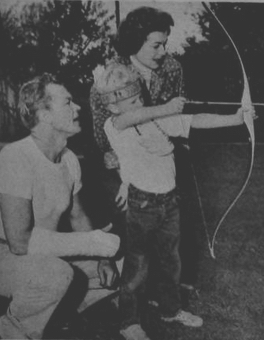 Remembering Barbara Hale: The Clay Pigeon (1949).